Sable is a singer/songwriter, composer and musician. Like everything else she does, she wears a variety of hats and is part of a few different projects. Recently, she has launched her Bandcamp pages to make her digital downloads more accessible. Join her Facebook fan page, her ReverbNation page, or her Bandcamp digital music site in the sidebar to keep updated! Some of Sable's music CDs are available for purchase on this page. We do not have a standardized shipping rate. Shipping will be calculated upon purchase, and billed to your PayPal account or email address. Your purchase will be shipped as soon as the shipping charges have been received. Our standard shipping service is the Canadian or US Postal Service, but we will ship via other methods at your request. You will be billed the shipping charges that we are quoted from your choice of shipping service. Please send us an email via the Contact page upon purchase with your shipping address and email address. Sable believes that internet music is the key to supporting independent artists. She invites you to distribute her music to your friends and encourage them to buy her albums or book her for performances! Free streaming and digital downloads available for purchase at Sable's Bandcamp site! By invitation, thirteen Pagan artists have come together to create an anthology of some of the best in Canadian Pagan music and spoken word performance. The artists featured in this collection span the length and breadth of this vast nation, representing many different genres of music and many differing Pagan traditions, reflecting the staggering diversity of these, our Northern Tribes. Some classics of Pagan music are featured, along with some of the most well-known artists of our time and a few up-and-comers. This anthology was created in support of Gaia Gathering: the Canadian National Pagan Conference. All artists featured here have donated the use of their work to the cause. All profits from the sale of this album or its tracks from this site go directly to the Conference. All rights to these works are retained by the artists and permission must be obtained from them in writing for any other use. Tracks: 12 plus one bonus track. Total run time: 56 minutes, 31 seconds. For more information about the artists or their works, please contact them at their websites (included in the track information). Special thanks to: The Ancient Gods, Sable Aradia, Vanessa Cardui, Heather Dale, the Dragon Ritual Drummers, Gallows Hill, Dano Hammer, JD Hobbes, Tamarra James, Brendan Myers, Parnassus/Chalice and Blade, Raven's Call and Tara Rice for your generosity and support of the Canadian Pagan community. (2015) By invitation, thirteen Pagan artists have come together to create an anthology of some of the best in Canadian Pagan music and spoken word performance. The artists featured in this collection span the length and breadth of this vast nation, representing many different genres of music and many differing Pagan traditions, reflecting the staggering diversity of these, our Northern Tribes. Some classics of Pagan music are featured, along with some of the most well-known artists of our time and a few up-and-comers. Cover created and donated by Gualter Reis. FREE Download or streaming HERE! (Donations gratefully accepted). *Bandcamp Exclusive! * I travel all over Western Canada during the summer event season, and this year, music was my focus. All of these 20 tracks were recorded between the Spring and the Fall Equinox in 2013. They are not professional recordings. There's a lot of ambient background noise of the various festivals I attended and all my mistakes are included. So why do you want to buy this album? 1. There's 20 tracks, all at the price of a normal-length album. 2. They capture the spirit and magic of the events I attended. If you were there, or wish you were, it's a good way to carry that spirit with you. 3. Often things have more passion live than they do when recorded more professionally. 4. You will get unique tracks from my various live performances that are not available anywhere else, and never will be. 5. You will get unique, live versions of some of these tracks that highlight the talents of friends and guest performers. You won't find them on another album either. Sometimes, I had to choose between two, three, or even four different live versions of the same song. I selected them based on the number of mistakes I made and how noticeable they were; how distracting the background noise was; whether I felt it best highlighted the song overall. whether you could hear the vocals; and whether it was more or less enjoyable than one or another version to listen to; and how interesting the performance was. Sometimes, you can't hear the vocals very well, or there is a quite noticeable mistake. That's because there simply was no other version of that particular track, and I wanted to offer as much variety as possible. This album, for obvious reasons, is exclusive to Bandcamp and only available in digital format. I hope you enjoy this intimate glimpse into my life over the summer of 2013. (2013) *Bandcamp Exclusive! * I travel all over Western Canada during the summer event season, and this year, music was my focus. All of these 20 tracks were recorded between the Spring and the Fall Equinox in 2013. They are not professional recordings. There's a lot of ambient background noise of the various festivals I attended and all my mistakes are included. So why do you want to buy this album? Videos available on this website at the Videos page. This album was released October 3, 2013 in digital format only. ORDER NOW at her Bandcamp site! (2013) The long-awaited sequel to "Of Dragons and Unicorns," Sable's new offering of acoustic and acapella fantasy folk and filk music spans 13 years of collected songs, including some of her most requested pieces in live performances. Sable's voice draws you into times long past and alternate futures, when buccaneers sail the seas, elves and adventurers pit their wits against fate, and gentle peoples quietly honour the earth. This album also features some contemporary pieces that speak directly to the human heart. Videos available on this website at the Videos page. This album was released Ostara 2013 in both digital and hard CD copy format at her Bandcamp site. (2012) Composed around the five cardinal elements of earth, water, fire, air and spirit. Each track is 15 full minutes in length to maximize your meditation experience, mixed with relaxing sounds from the natural world suited to that element. Composing, performing, and producing all music, Sable utilizes synthesizers, acoustic and electric instruments, bells, drums, rattles, wind chimes and the power of the human voice to create a virtual soundscape in homage to the forces of creation. Created for use in connection with her upcoming book "The Witch's Eight Paths of Power," this album is available in four versions; one with the music only, one with appropriate background nature sounds, one with isochronic tones and one with binaural beats (brainwave entrainment technology,) in digital or hard CD copy format at her Bandcamp site. Videos available on this website at the Videos page. (1999) Sable self-produced her first album, Of Dragons and Unicorns, which is a collection of filk and fantasy music with simple accompaniment; usually a single guitar, some recorder and keyboard. Of Dragons and Unicorns has sold about 120 copies and continues to be available in digital or CD hard copy format at her Bandcamp site. Sable has been compared to Leslie Fish, Heather Alexander, Blackmore's Night, and Janis Joplin. For more music from Of Dragons and Unicorns, check out the Videos page. Avalon Burning: Sable Aradia and Kevyn LeBlanc. 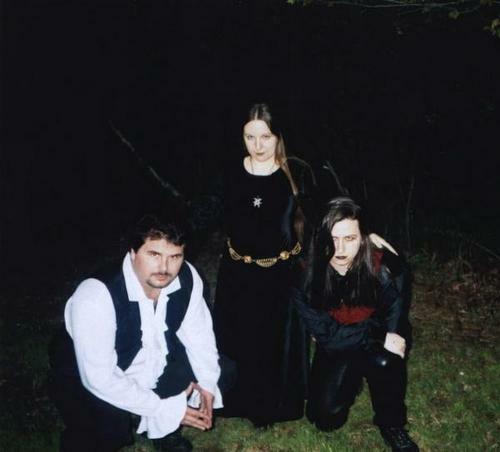 (2002) In 1999, Sable joined forces with talented metal guitarist and songwriter Kevyn LeBlanc, and in 2002 they produced Underdark Echoes, an epic metal filk opera based on the Drizzt Do'Urden novels by R.A. Salvatore. Unfortunately the project was never completed, but the demo remains available at their Bandcamp site. Avalon Burning has been compared to Mercyful Fate, Evanescense, and Pink Floyd. For Avalon Burning's music, check out their Bandcamp site or the Videos page. Gallows Hill: Roy Adams, Sable Aradia, Kevyn LeBlanc. 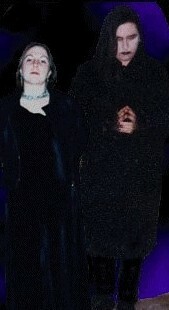 (2001, 2012) Gallows Hill is Sable and Kevyn LeBlanc's goth rock project. Sable joined forces in 1999 with Kevyn LeBlanc and Roy Adams, accomplished keyboardist and neophyte producer. Under Roy's label Dark Valley Records, Gallows Hill exploded on the independent goth rock scene at the turn of the millenium and developed a significant cult following in their short life span. The band broke up due to personal issues and circumstances in 2002, but not without making their mark on the goth rock charts at Mp3.com. Their biggest hit, "Solace," hit number three on the goth rock charts and stayed in the top ten for two months. Gallows Hill still has a cult following online at MySpace. They have been compared to Inkubus Sukkubus and Evanescence. For more Gallows Hill music, check out their Bandcamp site or the Videos page. (2012) Triune are Sable Aradia "the Maiden," Raven Brighid "the Mother," and Vichary "the Crone." Instruments by Sable Aradia. Demo album of Triune originally recorded 2000 for the Winter Solstice, acoustic and acapella, featuring traditional carols, re-imagined Pagan variants of traditional carols and Pagan holiday favourites rapidly passing into the realm of tradition. All profits from this album go to support the Pagan Pathfinders Podcast. Blessed Solstice! Videos available on this website at the Videos page. This album was released December 15, 2012 in both digital and hard CD copy format at Sable's Bandcamp site. Sign up for Sable's Newsletter! Merry Meet! ~ Copyright ©2010-2014.